To distribute 0 A.D. for Windows, we prefer to use the BitTorrent network. This page answers some frequent questions regarding BitTorrent. How to download 0 A.D. via BitTorrent? Install a BitTorrent client. Deluge and qBittorrent are two free and open source trusted applications we recommend, but you can use any client you like. All the screenshots we provide are made with the Deluge client. Download the small 0 A.D. torrent file from our site. 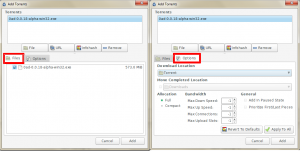 Open the torrent file with the torrent client. You can review a number of options before clicking “Add” and starting the download process. After that, the download of the real game will start. If a lot of people help us with seeding, it should be really quick! If you enjoy using torrents and if you would like to help us with your bandwidth, please consider leaving the torrent file and the downloaded game where they are! Other BitTorrent users can download the game from you, thus reducing the load on our own server. Why does 0 A.D. use torrents? The easiest way to distribute a file is by putting it on a central server. Then all users can download it from that server. But when there are many people downloading the files, one server is not sufficient, and placing different servers around the world is costly. As a free game, we’re not able to pay for these costs. But with peer-to-peer distribution (like BitTorrent), every computer can help spreading our game. When you download the game to your computer via BitTorrent, you automatically also become a small server as long as you keep running the torrent client. This way, you help keep the game freely available. BitTorrent is just as legal as surfing the web. Both are used to distribute content. You can sometimes find illegal content on websites, and you can also sometimes find illegal torrent downloads. 0 A.D. is free software, so you are allowed to download it through BitTorrent completely legally. The reason why BitTorrent comes in the news so often, is because a BitTorrent network is hard to shut down. If illegal content is found on a website, authorities can easily shut down the central server, and start a lawsuit against the owner. But with BitTorrent, everyone acts as a server, which makes it hard for the authorities to block illegal content. Is BitTorrent safe to use? Again, BitTorrent is just as safe as downloading a file from the web. When downloading a file from the web, you need to trust the one who made the file, and you need to trust the one who owns the server. Both have access to insert malicious software. When downloading via a torrent, you need to trust the one who made the torrent too. With the torrent distribution, we make the exe file, we make the torrent file, and we host both on our own servers. So other organisations can’t alter the game anymore, which makes torrent sharing a lot safer in our case. Server: A server is a computer that offers a service to multiple people. Like keeping a website or a file online. Any computer can act as a server, but professional servers are more expensive than regular computers. Seed: A seed is someone who has downloaded the entire file, but keeps the torrent open to distribute it further. It is important to have many seeds, in order to have a healthy network. Peer: A peer is someone who has the torrent activated and is downloading and/or uploading the file.